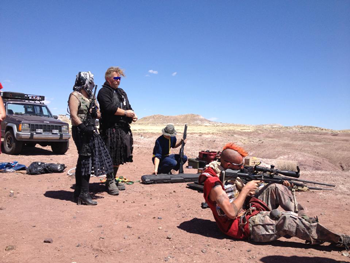 Uranium Springs hosts the best known live-fire shooting range in the post-apocalyptic event world where attendees bring their personally owned firearms to practice, compete, have fun, and mentor. Please follow the Uranium Springs Range on Facebook. All participants who wish to participate in the shooting range activities must pre-register for range access. The link for the form is at the bottom of this page. Please read all rules before registering. Please follow us on Facebook End of Days page for updates. ONLY PRE-REGISTERED shooters will be permitted to bring firearms onto the property. All participants who bring firearms onto the property must follow all the rules or fire arms which are listed below. There will be NO EXCEPTION for the firearms pre-registration. No last minute additions will be made. We will be reviewing the applicants and selecting participants to join the range activities, both experienced shooters, and those who who want to shoot but do not have their own weapons. You MAY NOT CONSUME ALCOHOL on the morning of the event prior to the shooting range if you intend to shoot. Failure to abide by this rule will result in being asked to leave the range and the event, because you have made a conscious decision to lower the safety of everyone attending. 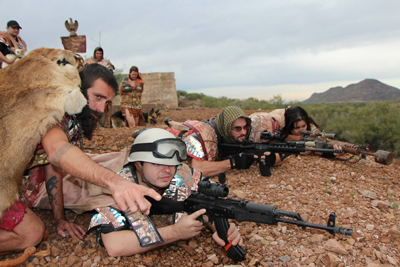 Range Officers are the law of the land on Uranium Springs shooting range – their instructions carry the authority of the event organizers and their determinations are final. Listen to their safety instructions and follow their guidance. Be certain of your target and of what is behind it. The range can only be approached and exited from one direction. That direction will be clearly marked on your Uranium Springs Map. If you are unsure of how to approach the range, ask any Uranium Springs volunteer. Approaching the range from any other direction is potentially dangerous and will disrupt range operations with a CEASE FIRE until you can be shown out of the danger area. All targets must be approved by Range Officers. Find a member of the range volunteer team and ask them to approve your target before placing it downrange. All firearms will be kept unloaded and locked in cases or display chamber flags until they are on the firing line. Firearms may not be moved from one position to another on the firing line while loaded. Everyone on the range is responsible for the safety of the range. Anyone witnessing an unsafe act or any person or creature in the range’s field of fire should shout CEASE FIRE and anyone hearing the CEASE FIRE instruction will echo it. Can I bring my [insert super cool firearm here]? It can be safely employed between the ranges of 5m and 200m. I don’t have a firearm – can I borrow somebody else’s? Many attendees are more than happy to allow fellow Uranium Springs citizens to use their firearms on the range. If you are interested in borrowing someone’s firearm, you are welcome to ask. Planning ahead by reaching out to them before the event and offering to bring your own ammunition is even better! I have never used a firearm before – am I allowed to be on the range? 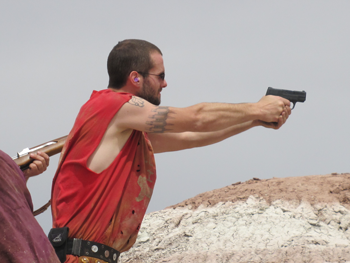 Many of the shooters at Uranium Springs firing range and every member of the range cadre have significant experience with a variety of firearms as well as coaching and mentoring. Several Detonation attendees have shot a firearm for the first time at Uranium Springs – just let the range cadre know that you are new.